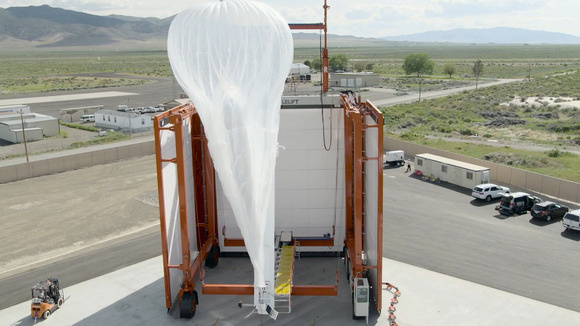 Google is succeeding in keeping high-altitude balloons aloft in the stratosphere for more than three months at a time -- a key goal in its ambitious Project Loon program to deliver Internet from the sky. Project Loon envisages bringing Internet to underserved regions of the world by beaming 4G LTE cellular data signals from balloons drifting at around 60,000 feet. For Project Loon to work at scale, Google will need to launch thousands of balloons to maintain continuous coverage. And for logistical and economic reasons, those balloons will need to stay in the sky for as long as possible. "Out balloon manufacturing has evolved quite a bit from the beginning," Mahesh Krishnaswamy, Loon's head of manufacturing, said in a video posted on Tuesday by Project Loon. "We've learned the hard way that ballooning is both an art and a science." Krishnaswamy said the team was now achieving "100+ days duration," which means it's hitting its initial longevity target. A key breakthrough in the company's development work came when it secured use of the McKinley Climatic Laboratory at Eglin Air Force Base in Florida. The lab includes a huge hangar-like structure where temperatures can be reduced to -60 degrees Celsius (-76 degrees Fahrenheit) and below. A Google Project Loon balloon undergoing testing at the McKinley Climatic Laboratory in Florida is seen in an undated video from the company. At those temperatures, balloons can be subjected to the same kind of conditions they experience at 60,000 feet and engineers can view how they perform. Critically, it also allows engineers to more quickly test different design and view weaknesses and failure of balloons. The video also reveals progress made in volume manufacturing of balloons. "We have unique equipment that actually cut and seals at the same time," said Krishnaswamy. "It only takes about two people to operate this whole thing compared to dozens of people on the previous design." The new machine not only cuts down on manpower but leads to a more consistent, higher quality balloon manufacturing method, he said. 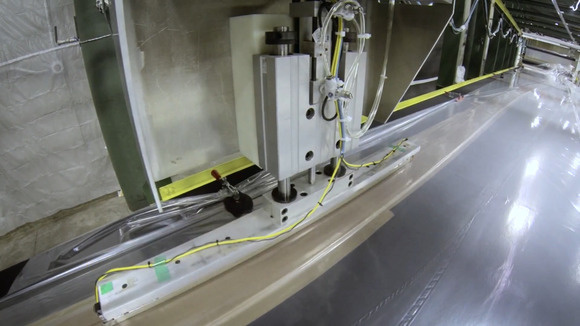 A Google Project Loon balloon manufacturing machine is seen in an undated video from the company. Another problem Google faces comes in launching the balloons. Its first launches used a large number of people and were fraught with safety concerns as the big balloons were released and shot up into the sky. The company has spoken about an automatic balloon-launching system in the past but the new video provides one of the best looks at the process. Each balloon appears to be held inside the launch by two sets of arms, one midway up the body of the balloon and one at the bottom holding the electronic cargo that hangs underneath the balloon. A heavy-duty crane from Wisconsin's Shuttlelift sits at the top of the giant three-sided structure, which is placed so the balloon drifts away from the fourth open side when the arms are automatically released. 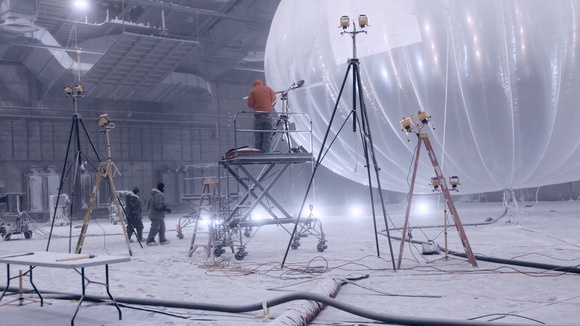 A Google Project Loon balloon is seen launching in an undated video from the company.